I have been a fan of the fabulous Virginia Lu for pretty much forever! 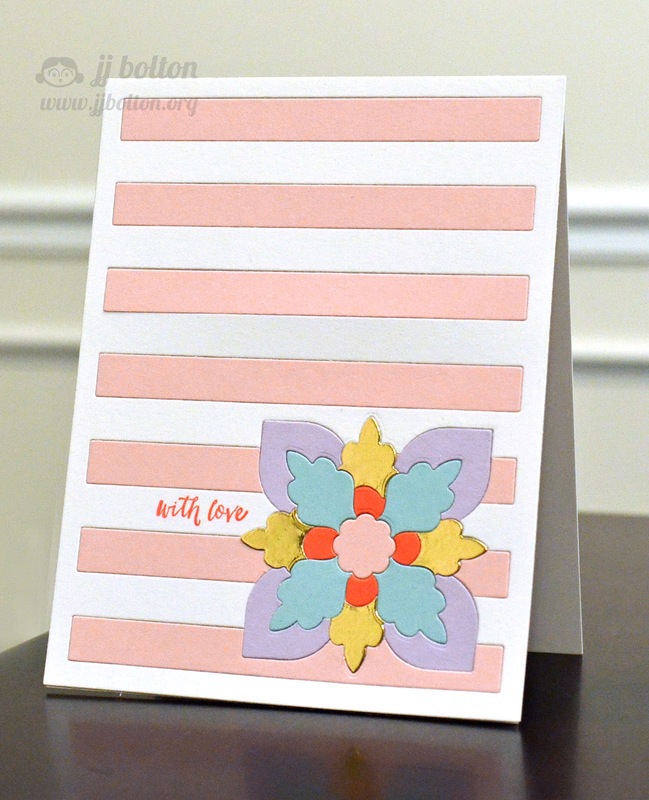 When I started making cards, Virginia was one of the first bloggers to catch my interest. She stood out for her cards (which are awesome), but also for her encouraging words and positive attitude. If there was such thing as a card ambassador, Virginia would be it! 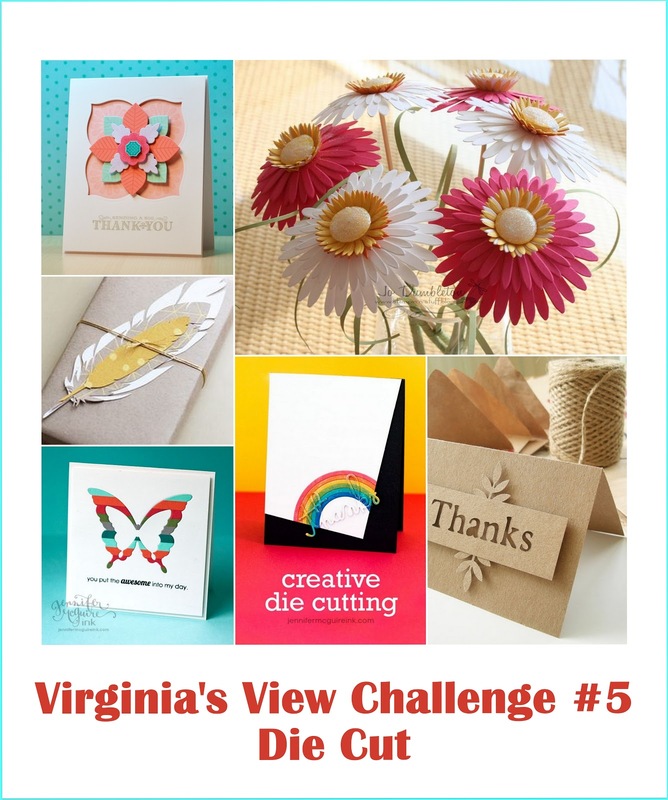 So, of course, when she asked me if I would play along with her Virginia's View Challenge, it was a no brainer. And even better, it's a die cutting challenge! Woohoo! The first two cuts are for the background stripes in pink and white. The one by one, I die cut the medallion starting with the largest purple piece. In order, I did purple, gold, blue, strawberry pink, and light pink. Here's a side look of the card that really shows the inlaid look! Thanks Virginia for letting me play along! You're the best! I love your inlaid card, JJ. So pretty. I've been making several inlaid cards recently since they are so easy to mail. LOVE this, JJ!!! So awesome and gorgeous! Inlaid dies just make me extraordinarily happy, so does your designing. Your card is gorgeous...love those colors. I know what you mean about Ms. Lu...she's always so upbeat and encouraging. Love to haunt her blogs...both of them. Inlaid die cut MAGIC!! A true labor of love J.J.! This is so soft & pretty. Love your inlaid pattern. Thanks so much. Wow! Love all the inlaid die cutting! So awesome, JJ! This is such a beautiful card, JJ! 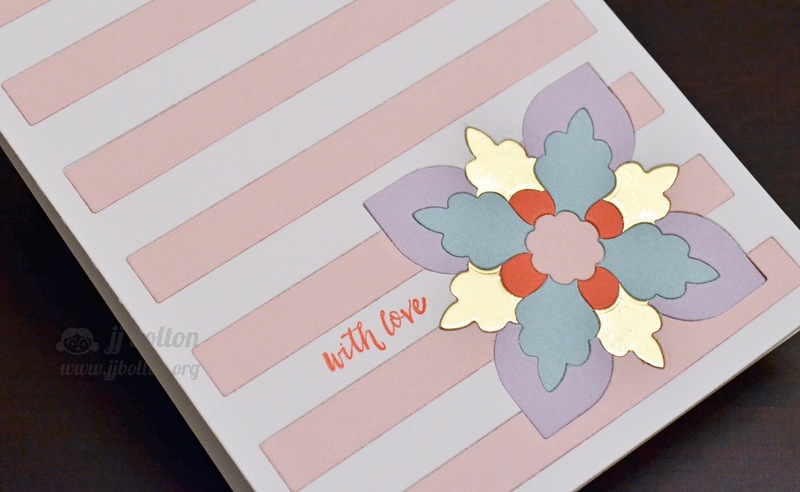 I love the soft pink striped background, and your medallion is fabulous using the inlaid die cutting technique! You are such an inspiration to all of us...In fact, I think you and Virginia can be described as Card Ambassadors!